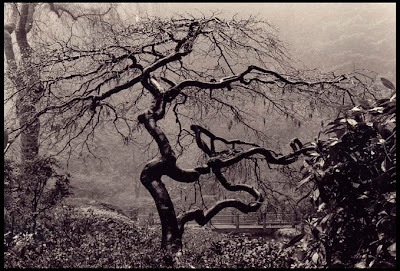 On a foggy, rainy morning in spring, this was shot at Portland's Japanese Gardens. The light was filtered due to the fog. I kept having to wipe the camera lens because it would mist over. This reminds me of Hemingway's line about gardens in Paris during the winter when "the trees turned to sculpture." Tech: Leica M3, Ilford Delta 100, developed in DDX, printed on Ilford Warmtone and selenium toned.